I feel I should be writing this post with an old-fashioned pen. You know the ones with the big feather on the end? Let’s sprinkle some pixie dust and simply just imagine, shall we? Once Upon A Time, in a magical land not so far away, two best friends had the most perfect, fairy tale, kind of day. 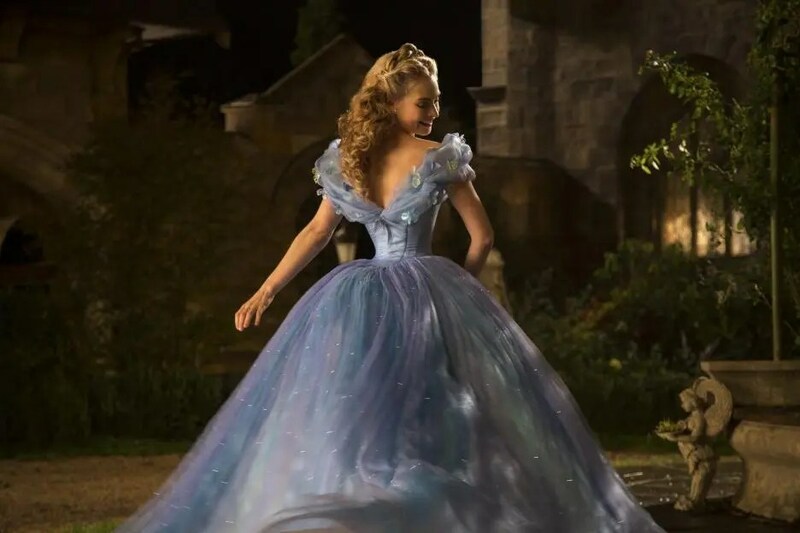 It all began with an invitation to a special screening for the Disney live-action film of the classic fairy tale Cinderella. Upon watching the trailer, I was instantly inspired to host a girly outing with my best friend. The movie is sweet and lavish and there is nothing sweeter than Cupcakes or more lavish than Bubbles. Watch the Cinderella trailer and get inspired for your own fairy tale party! It was a fairy tale day, but possibly not in the way you may imagine. I didn’t get glammed up for a ball like The Fairy Tale Traveler did at the Cinderella premiere in LA – you must check out her site to read all about her awesome experience. However, I did get to do something very special. I got to play hooky, in the middle of a week day, with my best friend from forever – ok since college, but that feels like forever ago! There were no boys, no kids, no work, and no errands to run, just simply two girlfriends doing girly stuff and hanging out. Sounds like a fairy tale, right? Well, it gets better. When thinking of bubbles, I immediately GO for my favorite sparkling wines: Iron Horse Vineyards from Sonoma County California. Nothing would be more perfect for this Cinderella inspired day than their Fairy Tale Celebration Cuvée made exclusively for Disney. It is the only house wine of the Magic Kingdom and only available at Disney theme parks, hotels and cruise ships. Barry Sterling of Iron Horse was inspired seeing the beautiful Wedding Chapel at Disney’s Grand Floridian Resort when he created this special Cuvée 30 years ago! It is the bubbly made for celebrations and one I imagine being served at the Prince’s Ball. Drinking the Fairy Tale Celebration Cuvée makes any day a celebration! 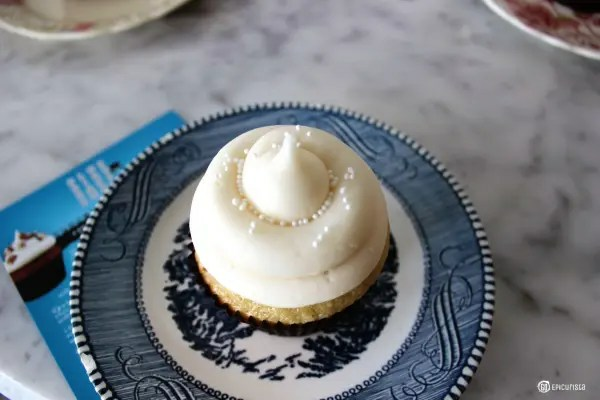 As far as cupcakes, there are plenty of options but only one would fit as perfectly as Cinderella’s glass slipper, a lovely local shop that has won multiple “best of” awards including being named by The Daily Meal in the Best 101 Cupcakes in America, Blue Bird Bake Shop. 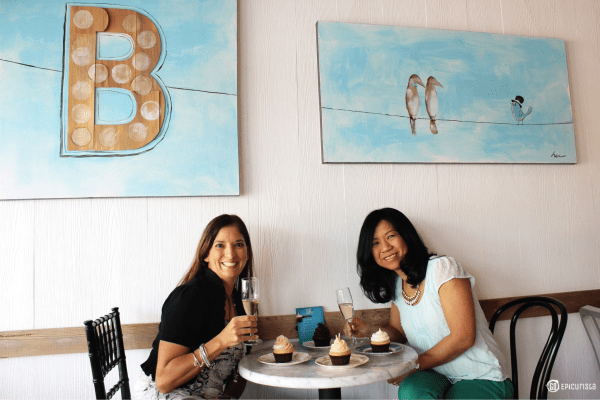 My best friend and I met up at this adorably quaint bakery with comfy seating and mismatched china, located in the Audubon Park Garden District of Winter Park, Florida. The name Blue Bird alone evoked images of the blue birds that flutter around Cinderella in the animated movie as well as the live version. Ceramic blue birds adorn the walls in the shop which is also quite charming. How the name came about was a story even sweeter than the movie and the cupcakes we shared. I will tell you more about that later but first let me tell you about the cupcakes. Oh those magical cupcakes! 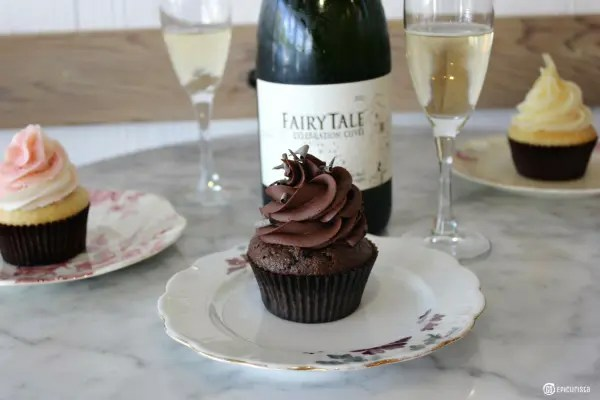 We sampled – more like devoured – 5 different flavors of cupcakes from vanilla to chocolate to strawberry and apricot, which all paired beautifully with the fabulous Iron Horse Vineyards Fairy Tale Celebration Cuvée, the owner was kind to allow me to bring in for me to write this story. Pairing wines with dessert can be a bit tricky. 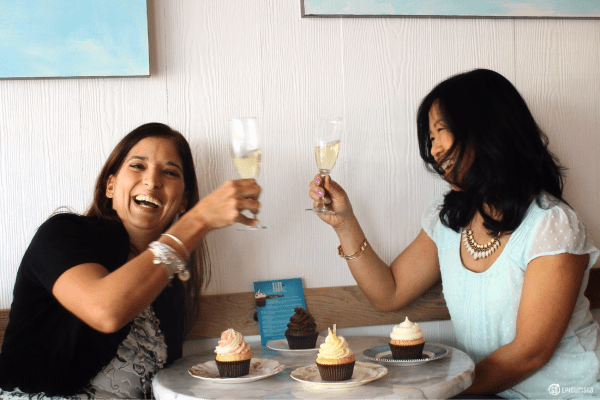 You may wonder if there is a secret to pairing bubbles with cupcakes. It’s common to think a sweet dessert wine will pair with a sweet dessert. The truth is, they tend to cancel each other out. Instead, look to strike a balance between the dessert and the wine. If the dessert is sweet, the wine should be a bit drier with good acid backbone. If the wine is sweet then you want the dessert to have some bitter tones like dark chocolate or crisper flavor notes of tropical fruit. Think of dark chocolate paired with a sweet port wine, for example. 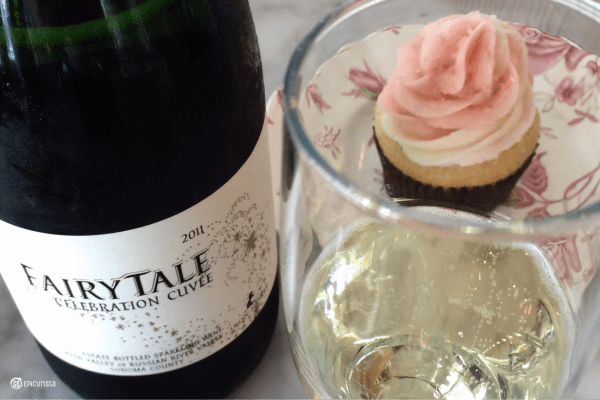 In this case, the sweet cupcakes paired with the well-balanced Blanc de Noir style Fairy Tale Celebration Cuvée. This elegant vintage estate-grown and bottled sparkling wine is made predominantly of Pinot Noir grapes, making it expressive and fruit forward, and then in a step away from convention they blend a bit of steely Chardonnay to add some acid structure. The wine has bright fruit aromas and flavors and brut-level dry so it is not sweet. It is rich and creamy which was perfect pairing with the cupcakes. It also helps to look at the flavor profiles of the wine so if it says it has notes of apricots, honey, peaches, strawberries or lime, then a great pairing could be desserts that also feature those flavors. If you’re still worried about what to pair with your bubbly, you can never go wrong with chocolate. Just like this sparkling wine, it goes with anything. No matter what flavors you choose, just remember as long as you enjoy it and share it with friends, there are no rules to tell you you’re wrong. GO Live it up! Blue Bird Bake Shop owners Jeff Lambert and Joel Pfrogner have their grandmothers to thank for their love of home-baked treats. Jeff also attributes his love of birds to the time spent bird-watching with her. Before she passed away she told him she would always watch over him in the form of a blue bird. When Jeff decided to leave his corporate job, #MakeSomedayHappen and pursue his entrepreneurial passion to open up a bakery, he and his partner spent months perfecting recipes but had not decided on a name for the shop. One afternoon, as they were discussing the bake shop, a blue bird magically appeared in their back yard and they instantly knew the shop would be named Blue Bird. I got goose-bumps hearing this story and I imagine like the blue birds and the Fairy Godmother that come to Cinderella’s rescue, Jeff’s grandmother is his fairy godmother watching over them. They began producing cupcakes for corporate accounts in 2008 and opened the retail shop in 2010 to the glee of everyone in the neighborhood. They went from 3 dozen cupcakes their first week to 300 hundred dozen per week today. I certainly think there is some pixie dust sprinkled over them! 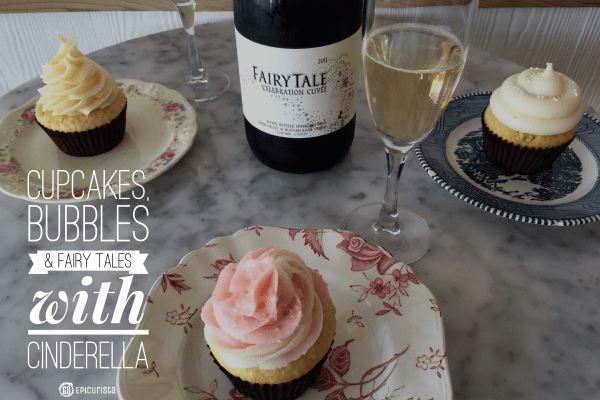 When I spoke with Jeff about my desire to pair our bottle of Fairy Tale Celebration Cuvée with his cupcakes, we discussed the flavor profile of the wine and the many flavors of cupcakes they offer in the shop. With over 50 recipes in their collection, I was spinning with cupcakes dancing around in my head. Jeff offered to create a special Fairy Tale inspired cupcake for me and the result was absolutely magical! The Strawberry & Vanilla Swirl cupcake features a moist blend of both strawberry and vanilla cake topped with a swirl of strawberry and vanilla buttercream icing and pink sugar crystals to give it that fairy tale sparkle. The natural flavors of strawberry and vanilla bean were vibrant and the icing was sweet but not in a saccharin artificial way. Similar to the Cinderella Movie, it was sweet and authentic. The pink cupcake was so beautiful and girly it instantly made me think of the pink dress that Cinderella wanted to wear to the ball. The Fairy Tale Strawberry & Vanilla Swirl special cupcake will be available for a limited time at the bake shop so please stop in this weekend and try it. It was a wonderful pairing with the Iron Horse Vineyards Fairy Tale Celebration Cuvée. 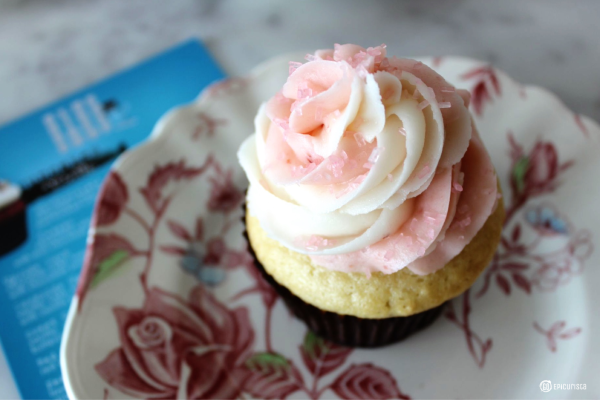 Blue Bird offers eight “everyday flavors” of cupcakes, baked fresh, from scratch, in small batches daily. Madagascar Bourbon Vanilla, creamy butter, real fruit and Dutch-processed cocoa are just a few of the quality natural ingredients they use. There are no artificial colors or sweeteners in their store and you can taste the difference. The Sweet Cakes Cupcake is the one I imagine being served at a fairy tale wedding. Vanilla cake with white chocolate chips topped with vanilla buttercream icing and sprinkled with white nonparails. Some may see this as a boring or plain “vanilla” cupcake but it was quite elegant and satisfying. 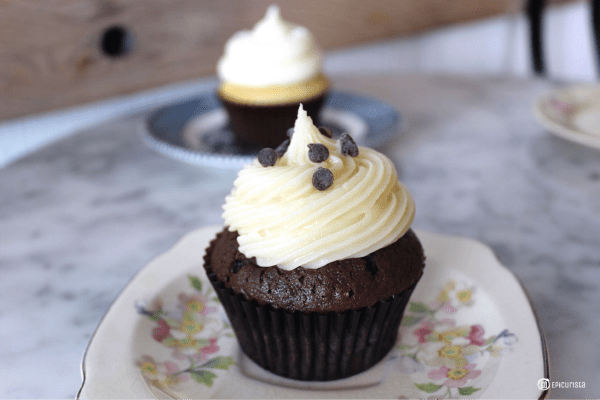 The Tuxedo Cupcake made of chocolate cake topped with cream cheese icing and mini chocolate chips was perfect for those that love chocolate and don’t want buttercream icing. It’s also dressed and ready for the ball! 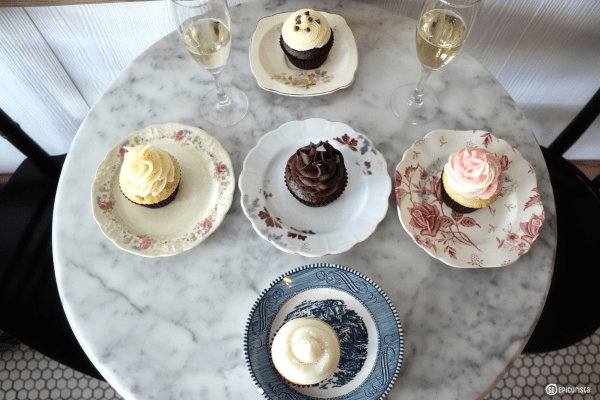 There is nothing better than chocolate and bubbly and the Ch-Chocolate Cupcake was perfectly decadent and rich. It’s a chocoholic’s dream made of chocolate cake topped with chocolate buttercream icing and chocolate curls. In addition to the everyday flavors, they offer a flavor or two of the day. There is always something exciting to choose from so follow them on Facebook to find out about specials and deals. On this day, the featured flavor was Apricot Ginger and this was spectacular with the Iron Horse Fairy Tale Celebration Cuvée. The vanilla cupcake with finely chopped ginger mixed in and a decadent swirl of apricot jam in the center topped with ginger cream cheese icing and candied ginger was an explosion of flavors. It offered that blend of sweet and spicy notes that were made even more expressive by the hints of spice and lime zest in the bubbly. Other popular everyday flavors include the Neapolitan with layers of chocolate, vanilla and strawberry cake and the traditional Red Velvet. I will also be on the lookout for the Chocolate Guiness cupcake with Irish Cream Icing to make an appearance on the daily menu. Doesn’t that sound spectacular?! See their full list of flavors. 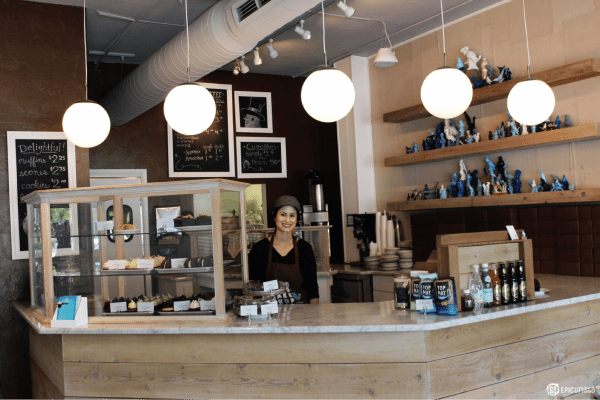 Blue Bird Bake Shop also makes brownies, cookies, scones, muffins, bars and cakes together with their own coffee, Top Hat Coffee, made with organically grown, fair trade beans. The staff at Blue Bird Bake Shop is so friendly! The shop is absolutely charming. The smell of fresh-baked goods gets you the minute you walk in the door. It’s like visiting grandma’s house, if you had a stylish and whimsical granny that could bake really well. This is a great place to meet up with friends and share conversation over sweets that will remind you of your childhood paired with a delicious specialty coffee drink. I hear their Toasted Marshmallow Latte is a real treat! Blue Bird Bake Shop is located at 3122 Corrine Drive, Orlando FL. 407-228-3822. Open Tuesday through Saturday, 7 am to 5 pm, and on Sunday, 10 am to 4 pm, or until they run out of cupcakes so get there early! Closed on Mondays. Cupcakes are $2.75 each or $30 per dozen which is quite reasonable for high quality baked treats. I must tell you about my love affair with Iron Horse Vineyards and why I selected them for this special day. This family owned and run winery has been producing award-winning sparkling wines since 1976. 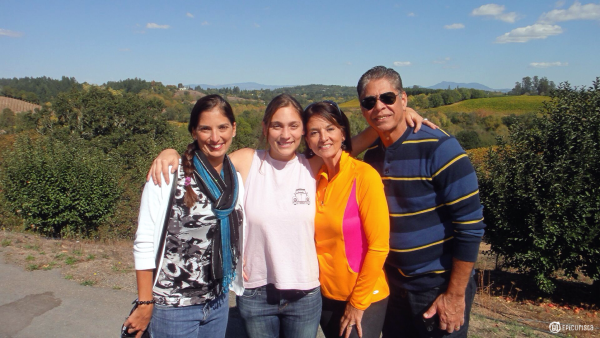 Three generations ranging in age from 19 – 84 call the property home and their love of the land is apparent in everything they do in their community, their vineyards, their wines and their life. They always strive to put back more than they take out. In the movie, we see Cinderella caring for the land and the animals around her in a similar way. Iron Horse’s motto is where rustic meets elegant and that is what Cinderella is all about. A love of the land! Cinderella’s motto of “Have courage and be kind” could very well apply to the Sterling family that founded Iron Horse Vineyards. Audrey and Barry Sterling fell in love with the property at first sight in 1976. They were sure they were lost driving down Ross Station Road until they came upon their own fairy tale land made of 300 acres of gentle rolling hills. Incurable romantics, and dare I say quite courageous, they bought the property in just two weeks and became pioneers in the Green Valley appellation within Russian River valley of Sonoma County. The fairy tale land of Iron Horse Vineyards in Sonoma County, CA. My first encounter with Iron Horse Vineyards was sampling the Fairy Tale Celebration Cuvée Sparkling at Epcot’s International Food & Wine Festival many years ago. I was instantly smitten. This wine is made exclusively for Disney. If you live in Orlando, you must GO and get yourself a bottle at one of the stores on Disney property or enjoy it in one of their fine restaurants. If you are not able to get your hands on the Fairy Tale Celebration Cuvée, then my pick is its sister, but not of the wicked stepsister variety, the Wedding Cuvée. It is their most popular, a rose sparkling voted #10 on the Wine Enthusiast’s Top 100 Wines of the Year. It has a beautiful rose color and you could probably call it a “Love Potion”. It is quite romantic paired simply with some high quality bittersweet chocolate. 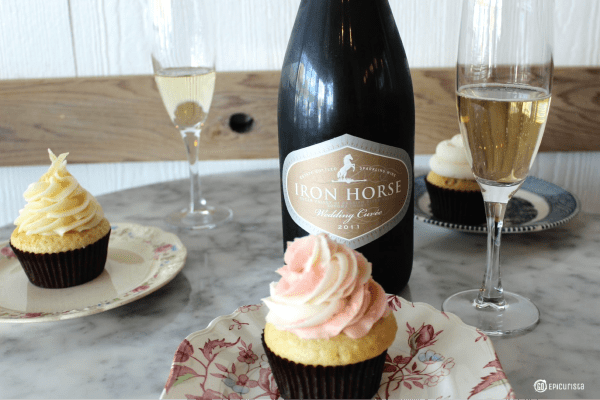 Iron Horse Wedding Cuvée is a Love Potion! I was fortunate to visit their gorgeous property not too long ago and completely fell in love with their wines even more. There is something magical about tasting the wines while overlooking the vineyards they come from and meeting the people who make them. It was lovely to meet Joy Sterling, daughter of founders Audrey and Barry and the company’s CEO. She is a dynamic woman who like Prince Charming has taken over the family business and infused her own style bringing the company to even greater accomplishments. I wish I had been able to spend more time chatting with her as she is fascinating. Rather than sitting behind a desk, she was conducting a tour of the property. Iron Horse Sparkling Wines have been served at the White House during the last five Presidential Administrations starting with the historic Reagan-Gorbachev summit meetings which ended the Cold War. It was the sparkling of choice to usher in the new century at the White House Millennium celebrations New Year’s Eve 1999, to honor the Pope on his 80th birthday, to honor the Queen of England at the Ambassador’s Residence, Winfield House in London in 2011, and to welcome the President of China in 2013. Iron Horse is definitely a sparkling wine for royals, presidents and heads of state so when you drink it you can’t help but feel a bit regal. Go ahead and lift your pinky finger if you want! Our tour guide was the charming granddaughter, Barrie Sterling, part of the third generation involved in the business. She was passionate about the property and most importantly the care of the vineyards and gardens. She shared with us stories of growing up around the vineyards and we got a chance to taste their full list of 12 estate bottled sparkling wines including the special limited production vintage sparkling they produce in partnership with National Geographic called Ocean Reserve. The winery contributes $4 for each bottle sold to establish Marine Protected Areas and reduce over fishing around the globe. This is a kind company indeed. 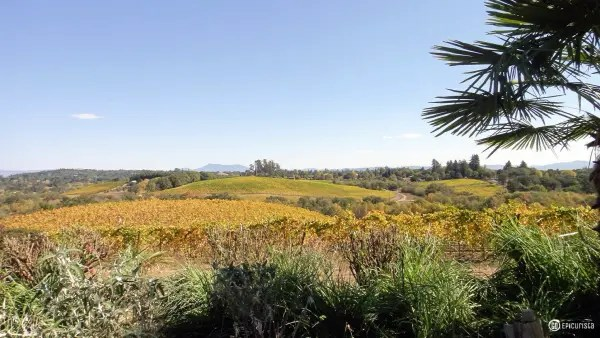 If you have the opportunity to visit California’s Sonoma County, take the beautiful drive to Iron Horse Vineyards located at 9786 Ross Station Road in Sebastopol. It’s a bit out-of-the-way from the main corridor of wineries but it is well worth it. I promise you will fall in love in this fairy tale land. Sparkling wine always helps kindle the spark! After our delicious time with cupcakes and bubbles at Blue Bird Bake Shop, we had some time to spare before the movie so we crossed the street to visit Orlando’s Foodie mecca, East End Market. This is a #MustVisit for anyone coming to Orlando who considers themselves a food lover. 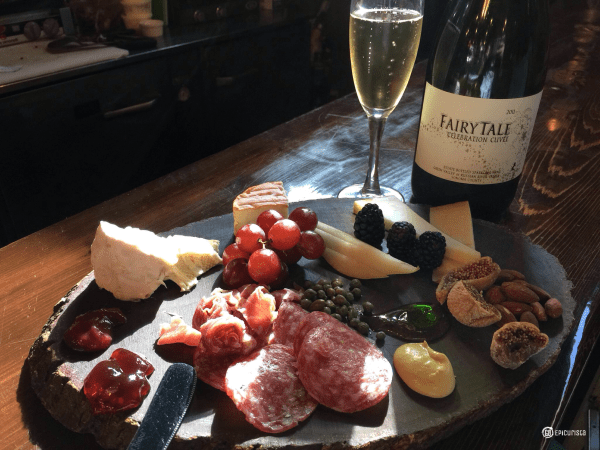 We still had some sparkling wine left and decided a cheese and charcuterie board from La Femme du Fromage would be a perfect way to help us finish the bottle. This is the best cheese shop in Orlando. Cheese is one of the few foods you actually see in the Cinderella movie, mostly because she shares it with her adorable little mice friends. They were certainly eating better than her and so were we. Read all about cheese and bubbly pairings on an upcoming post. It was an absolutely decadent way to cap off the afternoon and send us on our way to the theater with full bellies. I don’t remember reading many fairy tales as a child but I do remember Cinderella. The theater was full of girls of all ages anticipating their favorite childhood fairy tale, and I was one of them. This visually stunning movie brings to life the original 1950’s animated masterpiece in such a way that makes it classic and modern all at once. The story is not reinvented. We are not seeing a new version or some clever twist of who Cinderella or the Wicked Stepmother really were. It is the original story, there are no surprises. We know how it will end and yet we couldn’t help but weep during the sad scenes and cheer during the happy ones. The theater erupted in applause when the slipper fit! The beauty of the film is simply showing us how the story unfolds and bringing us into this magical world. Much is made about fairy tales giving the wrong message to girls and that Cinderella, like most fairy tale maidens, is simply waiting for her prince charming to rescue her. I am a strong and independent woman and I think differently. In this film we see a strong young woman who takes care of herself, who wants to be loved for who she is, who doesn’t need a man to rescue her, who is courageous and kind despite the evil that surrounds her and who is also a girl who wants to dress in a beautiful gown, wear gorgeous shoes and dance all night with her handsome prince at the ball. I can certainly relate to all of that and think it is a great message. Who said you have to forgo being girly and wanting pretty dresses to be an independent woman? Who wouldn’t want to be this girl at the ball? The Cinderella Movie not only celebrates who we are as strong women but also honors the little girl inside us who will never stop wishing upon a star. 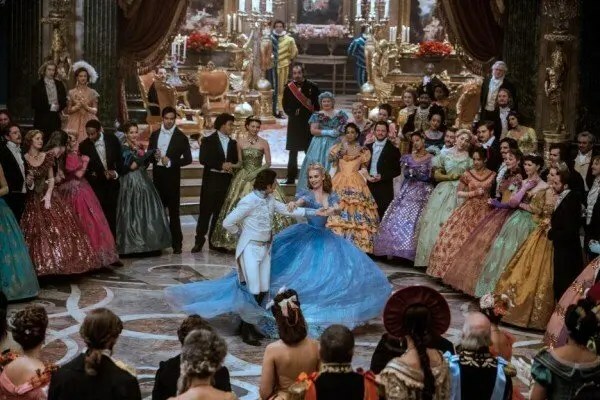 The film stars Cate Blanchett as the fashionable wicked stepmother, Lily James as the sublime Cinderella, Richard Madden as the handsome Prince Charming, Stellan Skarsgård as the calculating Grand Duke, Derek Jacobi as the King and Helena Bonham Carter as the Fairy Godmother. Directed by Kenneth Branagh from a screenplay by Chris Weitz, “Cinderella” is produced by Simon Kinberg, Allison Shearmur and David Barron. A perfect day of friendship, laughter, cupcakes, bubbly and fairy tales! Disclosure: For purposes of writing this article, I received free product from Iron Horse Vineyards, Blue Bird Bake Shop and media passes to the Cinderella Movie screening. No other form of compensation was received and all opinions are my own. As always, I only share with you experiences worth celebrating. Cheers! I love that Fairy Tale Cuvee by IHV, but I only though one could obtain it at EPCOT! Have you seen it at Disney Springs (like in The Pantry with all the Once Upon a Vine Wines)? Also, SO MUCH YES to Bluebird Bakery and Femme du Fromage! Two of my favorite haunts in Audubon Park! It was a treat finally meeting you in person the other night! We’ll need to arrange a Foodie Edition of Girls Nerding Out! Karen, thanks so much for checking out Go Epicurista!It was awesome to meet someone who is as into movies and food as I am! Fairy Tale Cuvee is divine, isn’t it? Your best bet for where to find it is to call ahead. It is such an exclusive wine, it is only placed in certain Disney restaurants. A Foodie Edition of Girls Nerding Out is definitely in order! Cheers!